Sydney Shop Girl: 'I Came to Say Goodbye' by Caroline Overington. Green Pasta. 'I Came to Say Goodbye' by Caroline Overington. Green Pasta. Waking up suddenly at 2am is the worst. The phone, a child calling out, a distant police siren or the neighbour's temperamental home alarm system. There's rarely a good reason for it and boy does your body react accordingly. The rush of adrenaline slices through the fog of your mind and makes you acutely aware of how dry your mouth is and how fast your heart is beating but it does little to jump start your brain and give it sensible ways to respond to the reason for your wake up call. I don't cope well with 2am starts and the day that follows is often very long indeed. If you're up with no chance of getting back to sleep, though, why waste that time tossing and turning when you could just be sitting up comfortably in bed reading instead? Not the greatest logic but it worked for me the other day. 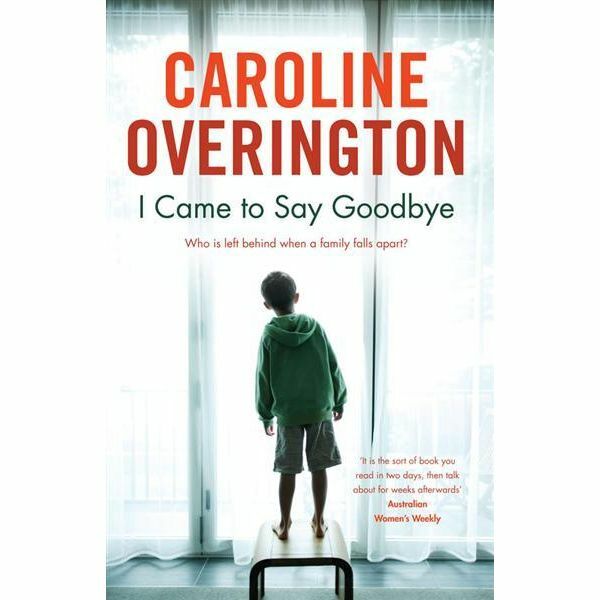 I started reading Caroline Overington's 'I Came to Say Goodbye' and was so engrossed that I had to take my Kindle to the breakfast table. I can't remember when I last did this and I'm glad I'm getting back into the habit just in time for the mostly lazy days of the Christmas / New Years break. 'I Came to Say Goodbye' is, to quote the AWW review I linked to, 'the sort of book you read in two days, then talk about for weeks afterwards'. Med Atley is a fifty something divorcee who lives in rural New South Wales. 'I Came to Say Goodbye' is an account of how he came to be intimately involved with the social services and child welfare departments of the Australian government. Written as a letter that aims to set the record straight, the novel tells the story of Med's troubled daughter Donna-Fay (nicknamed 'Fat') and how she came to lose all parental responsibility to both her children before finally being admitted for long term residential psychiatric treatment. Med knows that Fat lost her way when his wife left the family when Fat was only a child. She fell in with a bad crowd and the only boys that showed any attention to her were burdened with demons of their own. One of these relationships gives Fat and her partner a baby boy called Seth and it is when Seth is suspected of being a victim of 'shaken baby syndrome' that poor Fat's life spirals even more wildly into a place of darkness and psychosis. As he writes his letter, Med reflects on how naive he was in many areas. In trusting Fat's drug addicted partner and refusing to believe that he was the one who committed Seth to life of full nursing care due to extensive trauma inflicted brain damage. Not wanting to lose his daughter, Med went along with anything and everything that had even a remote chance of making her happy. Residential recovery in a government program located in Tamworth marks the next turning point of Fat's life. She becomes a mother again but is deemed incapable of parenting her child. Fat's older and successful older sister Kate steps in with her husband and they finally manage to adopting Savannah. The hard fought for happiness doesn't last long for the family, however. There are moments when the memories become unbearable for Med so Kat steps in to write parts of the letter but her suffering and grief is just as profound as her father's. 'I Came to Say Goodbye' is a moving and thought provoking examination of how government services can repeatedly fail the vulnerable. Bureaucracy, bed pressures, high staff turnover, the pressure to move people on... it's felt everywhere in our health system but no where as acutely as in mental health services. Through Med and his family, Overington has put a human faces to the headlines we read every morning while we inwardly shudder and say a silent prayer of thanks that 'it's not something I have to deal with'. Only it will be eventually given the prevalence of mental illness and addiction in our community and the increasing pressure to do more with less in our public health system. Have you read any of Caroline Overington's novels? This was my first one and I really enjoy her writing style. It's deceptively easy to follow and her characters are so real in their flawed normality. Using Cheerios, craisins and white chocolate chips for cargo in train carriages makes for interesting photos and a tasty play time but it also has given me a massive ant problem. Woolworths does catering platters!! Party food sorted. That Kmart stainless steel colander was the perfect size for holding the broccoli florets used in this recipe. Not Quite Nigella's Asparagus, Broccoli and Spinach linguini is a rather nice way to go meat free for dinner. Leftovers heat up very well for dinner the next night too. The recipe is very easy. The only issue I had was buying a dud brand of basil pesto. Sources tell me that home made is actually best (and easy) but if you're desperate then to use chunky basil dips from the refrigerator aisle rather than pesto from the pasta aisle results in a more flavoursome result. Do you have a favourite basil pesto recipe? Thanks for the novel recommendation! Haven't read any of Caroline Overington but I'm always on the lookout for those books that are hard to put down. I'm keen to read more of her novels now. I like the way she writes about suburban Sydney. Now that I live here, it has more meaning to me.